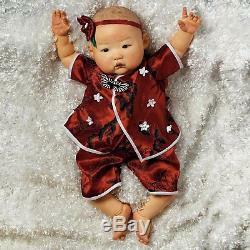 Introducing our newest Asian Baby Doll - Baby Mei! She is unbelievably sweet with her round full cheeks and chubby arms & legs that give way perfectly to her name meaning Beautiful Plum in Chinese. She is dressed in classic ruby-red jacquard sateen top with white contrast trim and traditional frog closure, simple matching pull on shorts finish her outfit. Her sweet head is adorned preciously with a red headband and beautiful flower embellishment. 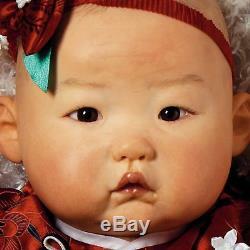 Baby Mei has the most delicate facial features with her round brown eyes, small nose and classic pouty baby lips. She has to be the most beautiful baby youve ever seen! "Baby Mei" is lovingly handcrafted from our trademarked Gentle Touch Vinyl, measures 20 inches from head to toe and 12 inches when seated, comes with a soft weighted cloth body, all accessories shown, a numbered Certificate of Authenticity and a collector's box. Artist: Ping Lau Size: Approx. 20 Head to Toe Material: GentleTouch Vinyl Weighted Cloth Body for a "Real Baby" Feel 3/4 Vinyl Arms and 3/4 Vinyl Legs Eye Color - Brown Hand Painted Black Hair for a real newborn look Hand set eyes, hand painted details and hand applied eyelashes Posable Edition Size: Open Handle with care, ages 14+. The item "Realistic Handmade Baby Doll Girl ASIAN Lifelike Vinyl Weighted Alive Reborn" is in sale since Friday, September 22, 2017. This item is in the category "Dolls & Bears\Dolls\Baby Dolls". The seller is "paradisegalleriesdolls" and is located in Grantsville, Maryland. This item can be shipped to United States, Canada, China, Mexico, Germany, Japan, Brazil, France, Australia, Russian federation, Denmark, Romania, Slovakia, Bulgaria, Czech republic, Finland, Hungary, Latvia, Lithuania, Malta, Estonia, Greece, Portugal, Cyprus, Slovenia, Sweden, South Korea, Indonesia, Taiwan, South africa, Thailand, Belgium, Hong Kong, Ireland, Netherlands, Poland, Spain, Italy, Austria, Israel, New Zealand, Philippines, Singapore, Switzerland, Norway, Saudi arabia, Ukraine, United arab emirates, Qatar, Kuwait, Bahrain, Croatia, Malaysia, Chile, Colombia, Costa rica, Dominican republic, Panama, Trinidad and tobago, Guatemala, El salvador, Honduras, Jamaica, United Kingdom.